Our team of contributors thinks these three companies have stellar management teams. The tech sector is constantly changing, making it hard to predict which companies are going to become the winners. One way for investors to get a leg up is to buy shares in companies with great management teams. After all, a well-run company will not only keep its financial metrics heading in the right direction, but it will also take the necessary steps to protect itself from the inevitable challenges thrown its way. With that in mind, we asked a team of contributors to highlight a tech company that they feel has a terrific management team. Read on to see which companies they picked and why. Tim Brugger: Check Point Software (NASDAQ:CHKP) CEO Gil Shwed may not be the first name that comes to mind in a discussion of well-run tech companies. After all, Check Point's peers are consistently posting more than 30%, and in some cases over 40%, jumps in quarterly revenue. By comparison, Check Point reported a 7% increase in sales in Q2, slightly down from several quarters of 9% top-line growth. Thing is, Shwed and team, in contrast with the likes of Palo Alto Networks and Fortinet have made a conscious decision to not take a "growth at all costs" approach. Check Point closely monitors its spending, a lesson others in the sector would be wise to follow, to deliver both per-share earnings and revenue growth. And it's working. Last quarter's 7% revenue increase led to an 8% improvement in earnings per share (EPS) -- 10% excluding one-time items -- along with improved operating income and cash flow. In the tech industry in particular, forgoing profits today to fuel growth for tomorrow is a norm. The question is: At what point do investors look at growth in the fundamentals? For shareholders of Check Point's peers, apparently the answer is "never." Check Point's tortoise-and-hare approach to its business, beyond its profitability, is also demonstrated by its stock-price swings. Over the past 52 weeks, Palo Alto Networks' stock has fluctuated by more than $83 a share, while Fortinet's has swung to more than twice its yearly low. Check Point? Its low is $71.64, and its high is $89.98. Relative stability, solid fundamentals, and delivering reliable results are why Check Point is one of the best run companies in tech. Brian Feroldi: Most investors have heard of Jeff Bezos, Larry Page, and Tim Cook, but another CEO that I think is deserving of high praise is Chad Richison. He founded online payroll processing company Paycom (NYSE:PAYC) back in 1998 and has remained at the helm ever since. Under his leadership, the company has steadily expanded its list of services and has become a major player in helping other businesses manage their back-office HR functions. Paycom's cloud-based solutions help employers hire, track, and manage their employees. The company's solutions have become a massive hit, which has allowed Paycom to gobble up market share. Last quarter, the company put up sales growth of 51%, allowing EPS to more than double. Those numbers are terrific, and since 98% of the company's revenue is recurring, Paycom is well positioned to keep growing at furiously high rates from here. But there's more to great management than just producing stellar financial results. Paycom has also done a great job treating its employees well, too. On company-review site glassdoor.com, Paycom was voted as one of the best places to work in 2016. Employees are currently assigning the company strong 3.8-star rating, and 84% of them approve of the CEO. Those are impressive numbers for a company that's still in hypergrowth mode. 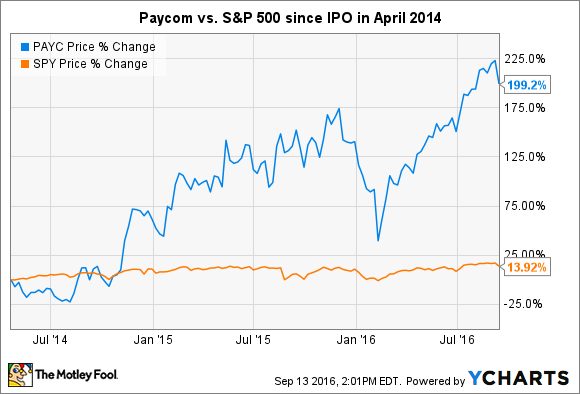 Perhaps it should come as no surprise, then, that Paycom's stock has been a rocket ship ever since it came public in 2014. With strong leadership in place, a recurring revenue business model, and a happy employee base, Paycom easily qualifies as one of the best-run companies in tech. Keith Noonan: Activision Blizzard (NASDAQ:ATVI) has managed to stay at the top of the volatile video-game industry thanks to deft management and consistently prescient navigation of industry trends, earning a place on the short list of the best-run companies in tech. The company has not been without controversies over the years, and CEO Bobby Kotick has sometimes received the ire of gaming enthusiasts, but no other publisher has a better history of introducing and maximizing the value of new franchises over the past two decades. The company has mastered the difficult art of hit replacement -- introducing new series that strike chords with players as previous properties begin to lose their pull. Activision Blizzard has also kept decade-old properties including Call of Duty and World of Warcraft alive as billion-dollar annual revenue generators. Stock performance can't always be taken as a great indicator of management quality, but Activision's gains are testament that the team running things has gotten a lot right through the years, with its share price increasing roughly 270% over the past five years and more than 550% over the past decade.